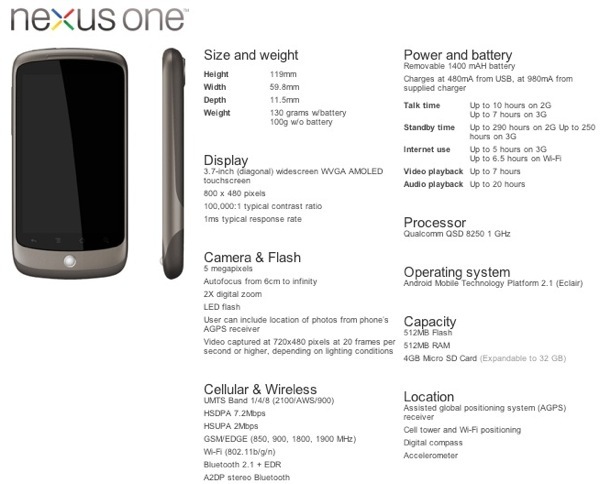 Google’s just revealed the Nexus One next-gen Android phone, and in general its tech specs are nothing, really, to write home about. But there’s a secret superpower. It’s voice controllable. Everywhere. As you can see, it’s pretty much as we expected. The 1 GHz snapdragon processor is there, delivering “what we love at Google: speed” (as described during the press event). There’s the 5-megapixel camera, 3.7-inch OLED screen and so on. “This is as powerful as your laptop was four years ago,” Android co-founder Andy Rubin said. One clever feature we didn’t know about before is that the trackball is LED-lit to act as a multicolor status indicator. Good news is that the phone supports both UMTS and HSDPA 3G tech, meaning it’ll work on Verizon as well as T-mobile’s services. That’s good news, though you’ll have to wait until the “spring” for it to reach Verizon, and later in the year for Vodafone around the World. And the phone will be sold for every location through this store site–as more operators and countries get added. It’s available for U.S. users now, and “test market” U.K. users and users in Singapore and Hong Kong. Google’s also planning on turning this site into a Web store for future phones from other handset makers, which kind of answers some of the questions about the device’s position in the overall Android game–Google sees itself as merely another player on the hardware side. Instead Google’s trying to position itself as a central retailer point for Android phones in the future (even if during the Q&A Google’s team was hedging this point). 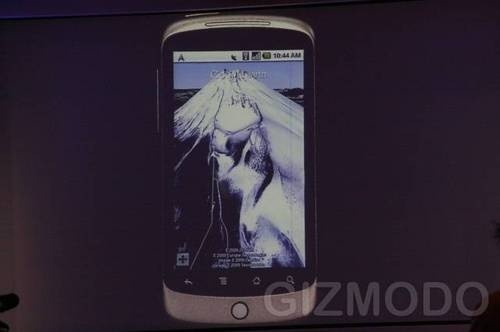 But the secret sauce that makes the Nexus One a bit special is its integrated voice commands. We know Google’s been working on background voice control and translation services for a while, starting with Google Voice and moving through Voice Search on smartphones–but the Nexus One takes all the tech on board, and its wired throughout the phone’s systems, even if all the recognition magic happens back at Google’s servers. So you can tap the phone and tell it to navigate you to a particular location, or auto-fill every textbox that pops up on the device–meaning you can dictate SMSs or even letters while you drive hands free. Voice control is even built into Google Maps for direct navigation to locations in that mapping system. The built-in noise canceling will also help with this voice recognition very much. Its clever, it’s a way of overcoming issues with heavy use of a touchscreen keyboard, and it’s very Android-like…almost reminiscent of the smart robots in Blade Runner that inspired its name. 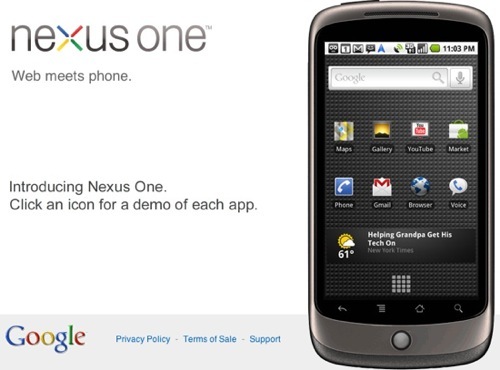 But though Google is branding the Nexus One as a “superphone” and positioning it as the pinnacle of Android phones at the moment, it’s not clear if all this voice power is going to be available on other high-end Android phones that’ll run Android 2.1 software. And Android 2.1 will go out to other manufacturers inside a few days. In other words, this $530 unlocked device is likely to be quickly outclassed by other Android phones from other makers–possibly even HTC, which makes the Nexus One, itself.